Does this article make you feel awkward? On Sunday, the charity Scope is launching a national television campaign to get people talking about why they might feel "awkward" around disabled people. 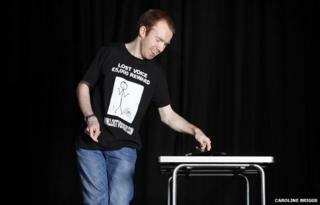 Comedian Lee Ridley, known as Lost Voice Guy, regularly experiences public awkwardness. Hello. I'm Lee, and I'm disabled. Do you feel awkward yet? In fact, I have a disability called cerebral palsy and, in my case, it means I can't speak (I use a communication aid to talk with - a bit like Stephen Hawking but better looking). I move like a zombie from The Walking Dead, and the right side of my body is weaker than my left. Do you feel awkward now? What if I told you that I also do stand-up comedy where I enjoy taking the mick out of myself and disability in general. How awkward are you about that? Judging by some audience members I've encountered recently, you may not know where to look. According to a survey by the disability charity Scope, two out of three people feel uncomfortable talking to a disabled person. So they have launched a campaign to help people to end this perpetual awkward stand-off. The awkwardness goes both ways though, rest assured. My tablet computer speaks my words in a synthetic voice but I have to write those words first. And because people see me writing, people think I'm also deaf for some reason - I'm not. You don't have to write everything that you want to say to me on a piece of paper, I can understand you perfectly. Of course, I will wait while you write down what you want to say to me, as, by then, I'll feel awkward too and I'm not going to make the situation worse by explaining things. I'll take the easy way out and let you continue, partly because I'm too polite, and partly because I can't be bothered to explain it... again. (Often I can't even read your writing but that's another matter). You're not too sure what's up with me either, or how to refer to me, are you? Awkward. Often this comes from people you'd expect might know a thing or two: a doctor once kept calling me physically challenged. I always thought that was a game on The Crystal Maze. Please don't get me started on the taxi driver who opened a conversation by asking me if I was as clever as Hawking! Of course, I'm not. The only thing I know about the universe is that He-Man is the master of it. Contrary to popular belief, disabled people don't all know each other and we don't all live on Disabled Avenue (which is just behind Pigeon Street) either. The survey by Scope also suggests that 43% of people don't know anyone who is disabled. Either those people are blind (which would be very ironic) or they don't understand disability that well. We're not all in wheelchairs. Some disabilities are more visible than others. Only 17% of people are born with their disabilities. The rest I call the not-yet-disabled, because being able-bodied is not a lifelong certainty, I'm afraid. Now that's certainly awkward. It's easy to joke about this awkwardness but it has serious consequences as well. I'm fairly sure I've been overlooked for jobs because potential employers couldn't see past my disability. Of course, if they had asked me, I could have explained how I work and put their minds at rest. They probably felt too awkward to ask but, until that changes, disabled people will always be fighting a losing battle - a particular problem with the benefits system in disarray as it is. When I started in stand-up comedy, I didn't do it to get people talking about disability more openly. But I'm fairly sure it has helped bridge the gap between disabled people and the not-yet-disabled people. I like to think I'm showing that disability is nothing to be scared of. It's something which can be joked about to help put people at ease. So, feel free to be curious and ask questions, it's the only way we can all become less awkward. Just don't write your questions on a piece of paper. Lee Ridley, aka Lost Voice Guy, is performing his one-man show at this year's Edinburgh Fringe at The Assembly Rooms from 1-24 August at 17:00 BST.